On August 28th, 1963, Dr. Martin Luther King, Jr. delivered this speech form the steps of the Lincoln Memorial. 200,000 people were there to hear it and those words have been echoing for the last 48 years. King provided a vision of a hopeful future to a people who had none. Martin Luther King was a great man and a great American and today is a day set aside to honor his legacy, a legacy for all of us. 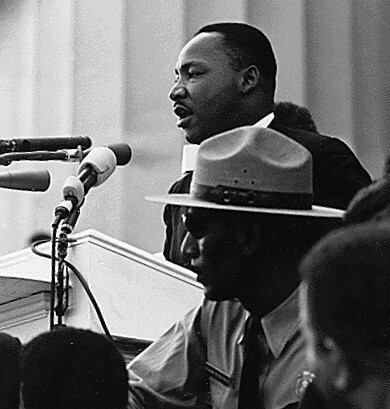 Here's the entire text of Dr. Martin Luther King, Jr.'s I Have a Dream speech. If you've never read it, now's your chance. Thanks for posting - for the beautiful intro as well as the whole speech. So inspiring. I love that my kids are coming home from school and talking about MLK. The only weirdness is that they don't really understand discrimination yet...it almost seems a shame to describe it to them because they are so innocent about it now. I guess it's one of those things that it's better to talk about than not so they won't stand for it in the future. Really nice post! Everyone should always remember the struggle that Dr. King did for ALL people! This is a wonderful post! I like Martin Luther and the way he view life. I find him very influential and inspirational as well. I once heard a very wise woman said "God created one race-- the human race--- people created racism"